I have a terrible habit of generalized procrastinating. Sure the bills get paid on time and birthday cards appear in mailboxes without needing to apologize for the lateness of their arrival. But most other things that have deadlines? I tend to cut those really close or miss them all together. Calendars don’t help me. I have three of them. And somehow, whatever appointment or date or deadline I need won’t be on the calendar I happen to be looking at. Maybe I need a personal assistant to stay on top of things. I had hoped that The Mistah could take on that responsibility but he’s more scattered than I am…we’re quite a pair, really. So until the cat learns how to coordinate my day planner, Yahoo calendar, and the 12 months of Sock Monkeys for 2010 hanging on the fridge, I’ve got only myself to blame. And since I do the cooking around here, I can only blame myself for letting ingredients sit unused and unloved in the refrigerator until they go bad. I’m at my worst with produce. Fruits and vegetables get buried in the bins until they bear only the slightest resemblance to their former selves. Cleaning out the crispers is always an archaeological adventure. The bag with mushy dark green torpedos covered in fuzz? Could be the cucumbers I bought weeks ago for salad. Or it could be a weapon of mass destruction lurking about my Frigidaire. And I could swear that the Tupperwear had jicama slices in it. But now it’s filled with an oozy slime that renders the contents unidentifiable. I sometimes wonder if I should be wearing a hazmat suit on those occasions when I get around to cleaning out the fridge. Because I’m sure that labs, where they actually mean to produce mold and penicillin, take safety precautions. And I’ve seen enough episodes of “How Clean Is Your House” to be properly skeeved out by the knowledge of what havoc bacteria can unleash. So it was with the intent to avoid another crime against produce that I dug out the last container of kumquats that had been languishing in the back of the fridge and decided to turn them into jam. Despite having been ignored for weeks in the chill of the side by side, I only had to throw out four or five kumquats which were beyond the realm of safety, even for jam. Because jam is your bff when you’ve let fruit sit around too long. Those peaches or strawberries (or kumquats) may not be pretty to look at, but cooked down with sugar and water, they will be transformed into glorious jammy goodness. I worked from the most basic of recipes. Sugar + water + fruit + heat + time = jam. The quantities were inexact and random. But they worked. 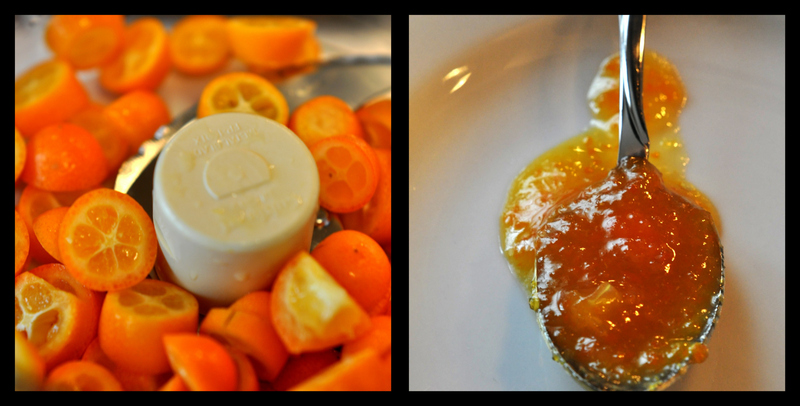 And since I happened to have some candied kumquats in simple syrup also sitting in the fridge, I threw those in too. It was one big, sugared kumquat party on my stovetop. Now, should I ever again find myself making kumquat jam, I’d like to remind myself to try adding the water and sugar to the kumquats in the food processor. I’m all about texture and the final jam had larger bits of fruit than I really like. I’m a jam girl, not a marmalady. Adam, the way I neglect my produce really is criminal. I’m surprised my picture isn’t plastered across produce sections and farmers markets in the Mid Atlantic. Ugh, we do the same thing with our produce. It’s so easy to forget about what is stored out of sight in those crisper drawers. But jam is a great idea. I like to make yogurt fruit shakes too b/c then mushy fruit is actually a good thing! Jen, smoothie and shakes are a great solution. Glad to know that I’m not the only person with this problem. I don’t think I’ve ever had a kumquat. Maybe next year! Beth, I saw kumquats at H Mart the other week. They were in that funny cold case in the produce section. Not the one with all the lettuce, greens, and tofu. The one on the other side of the produce section. Don’t wait a year, try them now. Wonderful blog..kept me entertained till the end..great blogging!Perfect witty ending. Glad to see you came back to visit. I don’t know what the weather is like for you in Italy but here in Baltimore it is HOT. I am hoping after the sun goes down it will be tolerable to head out for July 4th fireworks. ooh, it’s such a novel idea. i’ll have to go by chinatown and get some kumquat. Salty Pear, if you can find some kumquats, this jam is an easy, tasty way to use them.